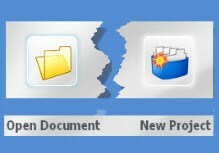 In Studio 2011 there are basically two options for translating a file: “Open Document” or “New Project”. You can select them by clicking the icons on the Home page, from the File tab or from the standard toolbar. But which is the best option? This is the easy way to go if you’re new to Studio. You can let Studio use the default settings (which you can fine-tune under Tools>Options) and you’ll be taken straight to the Editor window. When you save the bilingual file (.SDLXLIFF) with Ctrl+S and the translated file with Shift+F12, by default you’ll be taken to the folder where your source file is located. But what happens when you’ve got several Translation Memories (TMs), clients who have designated Termbases (TBs) or special field values for certain domains? You can set up all these options by clicking on the Advanced button in the Open Document wizard, but this is quite time consuming. Another drawback of the Open Document method is that you miss out on pre-translating your file against an existing TM. Also, there’s no analysis to see how many matches you’re going to get. You can run these tasks later on, but it takes longer. Finally, don’t use Open Document to re-open a file that you’ve already been working on. Instead, double click the project name in the project view. Once you’re familiar with the Open Document workflow, you’ll discover that the easy way to go is not always the best or quickest solution. I recommend using the New Project workflow, even for single files. When you set up a new project, you assign all the above options as you follow the wizard. It’s quite slow the first time you do it but if you base subsequent projects on existing ones (which is the first option in the wizard), you’ll soon find that the process gets very slick. You can also merge a group of files when you set up a new project, which gives you great leverage from auto-propagation and ensures consistency across the files. Another advantage of projects is that you can keep client-specific projects running and simply add new files to them (go to the project source language file list and click Add Files). That saves time because you don’t have to assign TMs or TBs, and all other settings have already been defined. Unfortunately you can’t “add & merge” new files to an existing project. I think this would be a useful feature to see in future versions. In short, I like the project workflow because I have more control of the translation process. I can decide where to save my files and I can keep source and target files in separate folders, so there’s no danger of overwriting the original file. I have immediate access to analysis results and other batch tasks. By adding a file to an existing project I can be up and translating in just 9 clicks. Yes, I counted! Please add a comment below if you’re a fan of the Open Document workflow, or if there are any more advantages or disadvantages for either option that you’d like to add. This entry was posted in 1. The Basics, SDL Trados Studio and tagged SDL, Studio, Studio Project, Trados. Bookmark the permalink. Nice article Emma… short, to the point, and very clear. I tend to side with you on this but I can see value in Open Document as well. I think if you only receive the odd single file project then working this way allows you to keep all the resources and bilingual files for that project in the same folders as your client folder structure and I think many translators like to work this way. But having said this I also know that many of the translators I have worked with and have explained the sort of things you have here, and shown how Studio can keep a neat structure with it’s own logic, were quite happy to change their ways. So I think much of the reason for liking Open Document is because of how people are used to working with older tools like Trados 2007. In addition to this the Open Document approach is excellent for testing files in a round trip, and for when you are trying to create custom filetypes and need a trial and error approach on the parser rules. I agree, Paul, that with a single file it’s nice to just add the bilingual file and translation to the folder where the source file is. But as it takes me longer to set it up, I prefer the project workflow. You’re right that Open Document is useful for testing files; thanks for adding that point – I hadn’t thought of it myself. Thank you, Emma. That was a clear comparison and now I know I am better off using New Project for my translations from now on. Glad it was helpful, Wieneke! Thanks Emma! I am one of these people who have had some incredible problem with Open Document. When I was new to Studio – coming from Trados 2007 – and used this function, the template that was the default at the time (SDL Trados) saved the TM and the settings. Every New Project I tried to create, used the same TM and settings and in spite of hours with support, they were not able to figure out what was wrong. Deleting and replacing every instance of the templates that I could find on the harddisk did not help. It seems Studio saves the info somewhere and retrieves it the next time you try to create a new project. The only reason you would use Open Document is if you have only one “big mama” Tm that you use for all your projects and only translate one document each time. As you say, learn how to use New Project, it has all the benefits and none of the disadvantages! Once you get the hang of it, it takes you tops two minutes to create the project. Hi Anna, yes, I remember you had quite a headache with the default template. I used to have a single “big mama” TM and ran Open Document to open single files, but then I didn’t always remember to enter the client’s name as a field value before I started the translation and so I couldn’t keep track of where each segment came from. That’s another reason I go for separate projects with predefined field values for each client. Concordo. É preferível criar sempre um novo projeto no SDL Trados Studio a abrir apenas um documento em Open Document. My pleasure Emma. As you can see it was very helpful for – at least – one of my students. Really useful article, Emma – I’m in the process of moving from my beloved SDLX to Studio 2011, and have already decided to attend a training day to start afresh using other ways of doing things that will probably be much more efficient than my own collection of workarounds and bad habits! I really want to get to grips with using multiple TMs efficiently – after using SDLX from about version 1, my big mama TM was pretty obese!). This is exactly the kind of thing I could see myself doing out of habit; I’ll be a lot happier working with New Project after reading this. Thanks. Hi Pippa, Yes, it’s a good idea to do some training to learn more about what you can get out of Studio. Hope the switch from SDLX goes smoothly. If you have any specific issues, send out a Tweet and I’ll be happy to help, along with other knowledgeable Tweeters. Good luck! How can I get hold of the documents in my project package to translate again to be able to send back a return package to my client??? Hope I´ve explained my problem well, and even hope more that you have any useful tips for me. Hi Astrid. There’s a difference between project and package. If you’ve translated the files outside the package that you’ve been sent, then I would locate the TM where you’ve saved the segments, and add that TM to the project that opens through the open package wizard (i.e. with the untranslated file in the Editor window, go to project settings and add the TM there.) That way, you can work your way through the translation and return the completed package. Pingback: Resources/Risorse 01/2013 | Glossarissimo! Pingback: (CAT) – Open Document vs. New Project in SDL Trados Studio 2011 | Signs and symptoms of translation | Glossarissimo! Hi Emma, thanks for your informative post. I want to replicate the way I work in DVX2, whereby I access one ‘big mama’ TM from a separate TM folder (containing TMs for my different language pairs); the translation project itself however is in the client folder. So far as a newbie, I have been creating a separate subfolder (I call it TRADOS) in my client folder; in this TRADOS subfolder I then Create New Project and access my big TM, which is located somewhere else. I’m not sure if this is the right way of going about things because I notice that all my previous translation projects are shown in this project and that is not really what I want; all I want to see is the current file or files I’m working on for that particular project. For my type of work I don’t need separate TMs and I don’t feel the need to track the origin of each segment. I’m happy with my ‘big mama’ approach, although this may change in the future. Can you clarify the different pros and cons relating to where files and resources are placed with the options: Create New Project and Open Document. If you can see previous translations in your project, then you are re-using the same project each time. I like this method, because I know that the right TM, TM fields, termbases etc. have already been assigned. But if you prefer, you can set up a separate project for each translation within your client folder and within your TRADOS subfolder. Just make sure you give each project a different name, and when you follow the project wizard, base it on one of your previous projects. You can still keep your big TM in its own separate folder using this method. I think it would also work for you to use the Open Document (single file) approach. That way Studio will automatically create your project in the background and will do it wherever your source file is. Keep your “big mama” TM in its own folder, and all other files (bilingual sdlxliff, sdlproj file and translated file) can be saved in your source file folder. Later, you can delete the project file and the sdlxliff file if you want. Maybe this would be easier in your case? I’m working on a file (via the Open Document option) and I tend to close the program at the end of th day. Is there a way to make Trados Studio automatically open the document I’m working on instead of me having to go to File view each time? Yes, as long as you’ve saved it and you’ve enabled the option “Automatically re-open previously edited documents”, which you’ll find under the File tab>Options>Editor>Start-up. Thanks! That’s what I wanted but couldn’t find it. I still do not quite understand the way Trados Studio 2011 “thinks” when creating a new project. Can you tell me why it creates two sdlxliff files in two different folders (for each language) with the same filename? I find this too confusing… I can never know which xliff is the one I am working on. On top of this, I save a copy with Ctrl+S to back it up, so this makes three bilingual files for each original file! There must be an easier way… what am I doing wrong? The sdlxliff file in your source folder is created from the native source file. You work on the sdlxliff file that’s stored in the target folder. When you save with Ctrl+S you don’t create a copy; you save the same file that you’re working on. Perfectly clear, Emma! So I can just delete (or ignore) the sdlxliff that has been created in the source folder and, if I just save with Ctrl+S without creating a copy, I will have only one sdlxliff file, the only one I need, which will be stored in my target folder. I have an issue regarding Trados 2011. When I want to add a file to a project I already created before it automatically generate a new sub TM under the TM i already use. The problem is that my translation now is not in one TM, part of the translation goes to the Main TM and the another part goes to the sub TM that trados create when I add a file to the project. Is there a way to add a file without trados generating a sub TM for me? When you add a file to a project, make sure you select “prepare without project TM”. That way you shouldn’t get any sub TMs at all.